I love breakfast foods, and will eat them for breakfast, lunch or dinner. Give me pancakes, French toast, or waffles. But when I order such items at a restaurant, I usually have to ask that the food is not served as usual. I request that they refrain from using a specific ingredient. I don't want powdered sugar on my breakfast! Powdered sugar, also known as confectioner's sugar, is simply a finely powdered sugar. Cooks seem to lightly dust this sugar on numerous items, from pancakes to brownies. It is partially a decoration but also adds some sweetness to the food. But I think it is over used. It seems to get added to far too many foods, creating more sweetness than is needed. For example, why should breakfast be such a sweet meal? Many people add sweet syrup to their pancakes, French toast or waffles, so why do they need the added sweetness of powdered sugar? They really don't. If you don't want the sweetness of syrup, you may not want the sweetness of powdered sugar either. So it seems silly that powdered sugar is a regular addition to pancakes, French toast or waffles. If anything, it should just be an option you can add to the food. You should have to ask for it to be added, rather than request that it be deleted. Most menus do not even mention that powdered sugar is added to these items. So if you don't see it on the menu, you can't assume that it won't be added. So what are your thoughts on powdered sugar? Would your children like to meet Santa? If so, why not also take them somewhere that you can also enjoy a delicious brunch. The Beehive in Boston’s South End will be holding a Santa Brunch on December 19 from 10:30am–3pm. Count on Christmas carols, photo opportunities (please bring your own cameras) and mingling and jingling with the big man himself Santa Claus! Couple all this fun with brunch items like Extra Thick Cut French Toast served with Chantilly Cream and Real Deal Maple Syrup ($11) or Beehive Eggs Benedict served with Virginia ham ($12.5o), spinach($12) or smoked salmon ($13). This is an event for kids of all ages not to miss! Call 617-423-0069 for more information and to make reservations. I will be there for brunch so maybe I'll see some of my readers there. Did you ever drink Mateus Rose? Many wine drinkers of a certain age will recall this Portuguese wine with its distinctive bottle shape. It had its heyday in the 1970s, though the brand still exists today. Yet I am sure that many of us don't know the story behind Mateus, and might even want to know more. 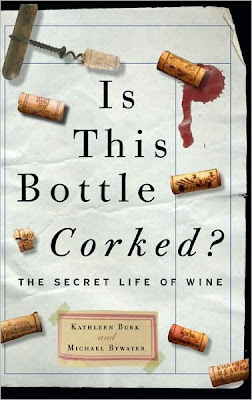 To me, such wine stories are very compelling. If such stories intrigue you, then maybe you will also be interested in a new wine book dealing with such interesting stories. Is This Bottle Corked? 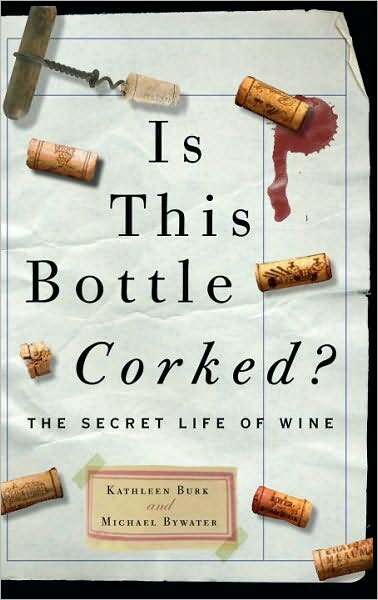 The Secret Life of Wine by Kathleen Burk and Michael Bywater (Crown Publishing Group, September 2009, $19.99) is a hardcover book of 196 pages. Kathleen is a Professor of Modern and Contemporary History at University College London. She also has a Diploma in Wine and Spirits, writes for the World of Fine Wine, and is a judge for the International Wine and Spirits Competition. Michael is an author, broadcaster, and teacher. He writes for the Independent, the Daily Telegraph, the Sunday Times, and other periodicals. He is also a regular broadcaster for the BBC. Is This Bottle Corked? contains over 85 short articles about a wide range of wine-related topics. It is an eclectic mix of topics covering education, entertainment, history, literature, science and much more. For example, you will find items such as: George Washington's favorite wine; What is a "comet wine"; Was Pliny the first Robert Parker; Pairing wine with curry; When to decant; and Wine references in Shakespeare. It is not a book you need to read from start to finish. You can select any article, in any order, to peruse and ponder. Whatever interests you the most is a good place to start. The articles are well written and often quite fascinating. They often contain information you won't usually find in other wine books or magazines. It is a fun and educational read. This book shows that wine writing is about far more than tasting notes and descriptions of wine regions. Wine is a wide-ranging topic, with an extensive history of compelling stories behind it. I am fascinated by such behind-the-scenes tales so I very much enjoyed this book. If you too like such matters, then check out this book. For a hardcover, it is relatively inexpensive and well worth checking out. When I opened this box of chocolate truffles, I was initially struck by the bright colors and shiny veneer. They almost seemed like large marbles. Sucré (French for "sugared") is a bakery for artisan sweets and desserts. They have a store in New Orleans, in the heart of the Garden District on Magazine Street, where they sell home-made and hand-crafted chocolates and pastries, a variety of gelatos and much more. But they also do mail order. Sucré sent me a complimentary sample of the above truffles to see what I thought. Gingerbread milk chocolate truffle: A blend of holiday spices with milk chocolate ganache, surrounded by milk chocolate shell. Candy cane white chocolate truffle: A velvelty white chocolate ganache infused with bits of peppermint candies in a pure white chocolate shell. I was impressed with these truffles. First, the thin chocolate shells on each truffle had an excellent chocolate flavor, smooth and creamy. It clearly seemed to be high quality chocolate. The interiors of each truffle were also moist and creamy with clear but restrained flavors. What I mean is that each truffle tasted like the flavor it was intended, but without possessing an overwhelming flavor. For example, the holiday spices in the Gingerbread truffle could have been overpowering but they were not. There was just the right balance of flavors in each truffle. The truffles were very well made and I savored the taste of each one. These truffles are available in 6 Pieces ($12), 15 Pieces ($30) and 21 Pieces ($42). So an individual truffle costs $2, which is a bit pricey, though you do receive a high quality product, and the prices is comparable to other high-end, artisan chocolate shops. They would make for a delicious holiday gift. As a special offer for my readers, you can receive $10 off any online Sucré orders over $70. You just have to enter the Code: SUCRE. In addition, a portion of every dollar spent online will go to benefit the LA/SPCA (Lousiana Society for the Prevention of the Cruelty to Animals). Why not check out their online catalog and see if anything appeals to you. ADDENDUM: I was originally told that the coupon offer would be good until December 23. Unfortunately, I just received word from Sucre that the offer actually expires today, November 30. I am sorry for any problems this has caused my readers. Do you know what foods best pair with Saké? You may not realize the diversity of Saké, which thus lends to its flexibility, allowing it to pair with a wide variety of foods. For more information, please check out my new article "Saké does not get into fights with food" in the Palate Press. You will learn what is considered the "red wine" of Saké, which pairs well with spicy Thai, and much more. While you are reading my article, you should also look at the other new articles in Palate Press too! You'll find articles covering topics such as Wine & Sulfites, the European Wine Blogger's Conference, and Beaujolais Nouveau 2009. Before I begin to enjoy the great bounty of food and wine the day will bring, before my family and friends arrive at my house, I want to reflect on the past year. Much of my thoughts at this time are very similar to those I voiced a year ago. Though this is a time when many of us reflect upon our lives and consider everything we should be thankful for during the past year, this type of reflection should not be limited to Thanksgiving. We should regularly reflect on our lives and be thankful for what we have. No matter how bad our lives may seem at times, there will always be something of which to be thankful. Seeking the positive may help brighten the darker parts of our lives. I have much of which to be thankful. I am very thankful for my family, especially my loving wife, my wonderful mom, my special nephew Thomas and special niece Jessica. I look forward to spending time with them on the holidays, and the rest of my family, and sharing the bounty of the year. I am thankful for my friends, both old and new. This includes my Thursday night wine buddies, my poker friends, my gaming buddies, my North Shore Winer friends, and the wine/food bloggers I have met online, and off, during the past year. It also includes wine store owners, wine distributors, wine makers, chefs and more who I have met and chatted with this year. My food and wine events this past year have brought me into contact with so many good people. I am thankful for so much. My good health. My home. My new car. My weekend trips this past year. My two affectionate cats. I am thankful for my position as a food/wine columnist at the Stoneham Sun. I am thankful for all of my readers, of my blog and newspaper column. It has been so great to meet some of my readers over the past year. The list could go on and on for all of which I am thankful. But I won't make this much longer of a post. Just make sure that you consider your own lives and be thankful for everything you have. Raise a glass of wine today in thanks. Enjoy your family and friends. Savor life and dine with passion! This December, Slow Food Boston is kicking off a series exploring the food traditions of local immigrant groups. First stop: Brazil! On December 3, from 6:30-9:30pm, join Slow Food for a Brazilian Cocktail party at the Massachusetts Alliance of Portuguese Speakers (MAPS), their host and partner for the event. MAPS is the state's largest immigrant assistance organization, working with Portuguese, Cape Verdean and Brazilian populations in the Boston area, Framingham and Lowell. Enjoy a frosty caipirinha, piping hot cheese rolls and seven other delicious appetizers prepared by the Brazilian staff of MAPS. Tickets cost $20 and the proceeds will be donated to their AIDS/HIV Prevention & Education Program. You can reserve tickets here. The MAPS offices are located at 1046 Cambridge Street in Cambridge, just off Columbia Street. Detailed driving & walking directions can be found here. Via MBTA, you can take the Red Line to Harvard Square or the Green Line to Lechmere, and then catch the #69 bus on Cambridge Street. There is street side parking available in the area. Next up: a Vietnamese picnic in spring 2010. My new column of "A Passionate Foodie" can be found in the November 25 issue of the Stoneham Sun newspaper. This is a weekly column that concentrates on reviews of local restaurants though it also sometimes touches on other food and wine topics. The new column has been published today and will be available online soon. The new article discusses an interesting statistic, how 85% of the clientele of Myers + Chang, an Asian restaurant in Bostons South End, is female. The article speculates as to some of the reasons for this intriguing fact. It is the season for wine tastings, many different stores holding grand tastings with 50+ wines available to try. I have recently attended a few of these tastings and compiled a list of my favorites. I have grouped the wines by the name of distributor, which might make it easier for you to locate these wines. 2008 Salzl Gruner Veltliner ($13)--This Austrian white wine has an enticing, aromatic nose with bright, delicious citrus fruit on the palate. It has plenty of acidity and a satisfying finish. It may not be a grape with which you are familiar but one taste and you will become a fan. Great on its own or with food. 2006 Redondel Teroldego ($19.99)--From the Trentino region of Italy, this wine comes from an excellent vintage. And it certainly was an excellent wine, with lush fruit flavors, especially blueberry and plum. It was a smooth wine with a pleasant, lengthy finish. A full bodied wine with hints of spice, I could also drink this wine on its own, or with food, from pasta to venison. 2005 Bianco Aldo Barbaresco ($39)--From the Piedmont region of Italy, this producer's vineyards are next to those of Angelo Gaja. The wine has a light red color, with an enticing spicy nose. The red fruits are restrained and there are some earthy elements too, slight hints of mushroom. It has a long, enjoyable finish and is a wine to savor over time, to enjoy its complexity. It is probably best accompanied by food and is worth the price. 2007 Anne Amie Cuvee A Muller Thurgau ($14.99)--From the Williamette Valley of Oregon, this white wine is made from 100% Muller Thurgau, a popular grape in Germany. This producer though has created a delicious wine, which indicates this grape may thrive well in Oregon. It is crisp with bright fruit flavors of peach and lemon, with slight floral notes. If you are looking for a different white wine to try, give this a chance. 2007 Metz Pinot Gris ($19.99)--This organic Alsatian wine has plenty of character. Crisp and dry, it has tasty citrus flavors, some mineral notes and a very clean finish. 2007 Hendry HRM Zinfandel ($18.99): This is not your usual California Zinfandel. First, it only has an alcohol content of 13.8%. It has an alluring aromatic berry smell and on the palate is very smooth and not over the top. It has nice red fruit flavors, mild spice accents and a long finish. This is not that big, bold Zin you might expect. It is far more restrained and well worth checking out. 2008 Cucao PX ($13.99)--This unusual Chilean wine is made from the Pedro Ximinez grape, which you may know more for being a Spanish grape. Yet it is also one of the oldest grape varieties in Chile. This wine sees no oak so the grape is allowed to fully express itself. The nose was muted but the palate was intriguing. A dry wine with restrained fruit, including pear and pineapple, and a spicy backbone. Not at all what I expected but quite tasty and highly recommended. 2008 Zenato Lugana di San Benedetto ($16)--This Veneto wine is produced from Trebbiano di Lugana and sees no oak. The wine bursted with bright citrus flavors including peach and orange, ending with a slightly bitter finish. 2007 Veramonte Pinot Noir Reserve ($15)--From the Casablanca Valley of Chile, this wine is a great value! You find few Pinot Noirs of this quality for under $20. It had a light red color, with fresh cherry flavors, a touch of vanilla and other spices. It was a smooth, easy drinking wine with some character. Highly recommended! 2007 Revelette Coteaux de Provence ($15.99)--This biodynamic wine is a blend of Chardonnay, Ugni Blanc and Rolle (aka Vermentino). It has a very interesting taste, a melange of spice, herbs and subtle citrus fruits. 2006 Lesec Costieres de Nimes VV ($16.99)--A blend of Syrah, Mourvedre and Grenache which is sure to please. Lush tastes of blueberry and plum, subtle spices, mild tannins and a lengthy finish. A good food wine. On December 8, Park Square’s Italian eatery Da Vinci Ristorante and Mionetto’s Area Sales Manager Pamela Crowley will team up to host “The Evening of Perfect Pairings.” This five-course specialty Italian wine dinner promises an evening of Executive Chef Peppino’s culinary creations expertly paired with Crowley’s wine choices. Pamela Crowley will introduce each course and provide a brief commentary on the selections, alongside Chef Peppino. For more information or reservations, please call 617-350-0007. I recently had the pleasure to meet Jouji Sato, the owner of the Hinomaru Jozo Brewery, and taste two of his Sakés. His Manabito Kimoto Junmai Ginjo is an exceptional Saké, one of the best I have tasted in some time. Tim over at UrbanSake now has posted an interview with Jouji Sato. Please check it out to learn more about Sato, his Saké, and brewery. As his Saké has not been in the American market for long, this is a good opportunity to learn more about it. When a new restaurant opens, there are a number of people who rush there and soon after post their thoughts and reviews. There is certainly nothing wrong with that and I engage in such behavior sometimes as well. Plenty of readers want immediate knowledge about a new restaurant. But this comes with a caveat. Anyone reviewing a new restaurant must take into consideration the fact that it is new, and thus needs some time to work out all of the kinks. You cannot expect perfection from the start. It generally takes 2-3 months before a restaurant has worked out its issues. Menus may need to be revised, servers may need additional training, the food may need some refinement. Unfortunately, some reviewers fail to understand this vital point. They write overly negative reviews, without giving any leeway to the new restaurant. They seem to expect perfection from the start, and that expectation is unwarranted and unjustified. Readers should also keep this in mind when reading any review of a new restaurant. It would be beneficial to conduct follow-up reviews of new restaurants, to monitor their progress, to see how they have changed, if at all. Hopefully you will see positive changes, a correction of any prior issues. After three months, hopefully there will not be any more issues. If issues still exist, then that is a sign of something seriously wrong with the restaurant. Those 90 days should be sufficient to resolve any problems due to their newness. And if you are at a new restaurant, and detect a problem, please inform the management about it. They will want to know about any issues so they can rectify them as soon as possible. If the management is unaware of a problem, they can't do anything to fix it. Don't rush to judge a new restaurant. Understand the complexities of operating such a new endeavor and give them some leeway. With the holidays approaching, numerous coffee table books are published and offered as gift ideas. The basic idea of such a book is for it to be displayed on a coffee table for guests to see, thus sparking discussion about its contents. Such books also usually visually appealing, containing lots of colorful photographs and illustrations. 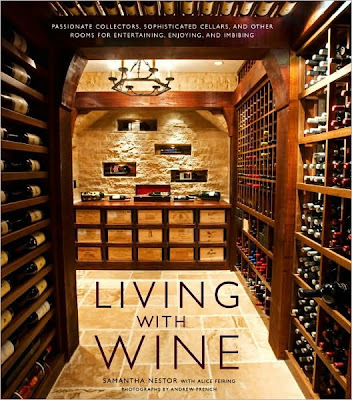 For wine lovers, you might be interested in Living With Wine: Passionate Collectors, Sophisticated Cellars, and Other Rooms for Entertaining, Enjoying, and Imbibing by Samantha Nestor and Alice Feiring (Crown Publishing Group, October, $75.00). This is a coffee-table sized hardcover of 256 pages. Samantha Nestor is the special projects editor at Metropolitan Home magazine (which will fold at the end of this year) and a contributor to PointClickHome.com. Alice Feiring is a well known wine writer, author of The Battle for Wine and Love, and Veritas in Vino. The photographs in the book were taken by Andrew French. The book presents 30 wine cellars, from all across the country. Each section describes the cellar, the owner, and includes some of their favorite wines. The book is divided into five chapters, each chapter collecting cellars with the same general purpose. This include: The Entertaining Pair's Lair (where the cellars are also used to entertain); The Gentlemen's Haven (for big collectors, those with many trophy wines who might even have cellars within cellars); The Sybarite's Sanctuary (luxury cellars which are objects of display); The Modernist Refuge (more innovative, nontraditional cellars) & Urban Retreats and Inspiring Spaces (cellars with limited space and commercial wine cellars that inspire). For all of these individuals, the wine cellar is more than just a place to store wine. They are intended to be aesthetically pleasing, as well as to display the owner's personality. These are not inexpensive cellars, and most of us can only dream about one day owning such a cellar. Thus, the book becomes more a fantasy for many readers, the cellars we might build one day if we won the lottery. As such, the book might not appeal to everyone though the photography is very stunning. My own favorite of the cellars is the "Ode to Saké," where a man who collects wine and Saké had special refrigerators built into his wine cellar to accomodate his Saké. Interspersed between the cellar articles, are some small side bars on a variety of topics such as Artwork & Collectibles, Technology and Kosher Wine. Though these items are short, they do make for interesting reading, and add to the value of the book. At the end of the book is a Resources chapter with contact information for architects, furniture, lighting, computers and much more, each keyed to the specific wine cellar that was previously described. So if you ever get enough money, you will know who to contact to build your cellar. At $75, this is not a cheap book and I don't think it is going to appeal to a large audience. It is well written and visually appealing, but I am not sure the subject matter will be too compelling to a general wine-loving audience. For those who do find the subject matter interesting though, then you will likely enjoy this book. I am so pleased to see more and more Saké on the shelves of local wine stores. I have already posted about some of them, and will continue to post about any other I find. Support your local wine store that carries Saké! I recently held a special contest, in conjunction with the Hachette Book Group, where the contestants could win two new cookbooks, one Greek cuisine and the other dealing with chocolate. The first book is How to Roast a Lamb by Michael Psilakis and Barbara Kafka, which deals with New Greek Classic Cooking. The second book is Chocolate: A Love Story by Max Brenner and Yonatan Factor, which contains 65 chocolate recipes. These new hardcover books are worth over $60. The contest ended at midnight on November 18, 2009. It is now time to announce the two randomly chosen winners. Congratulations to the winners! Please email me your mailing address so you can receive our books. Thanks to everyone else who entered. While persuing the shelves of your local wine store, you may see a label marked 90+ Cellars. This label is currently sold in about 90 wine/liquor stores in Massachusetts, as well as being available in about twenty other states. But what is the story behind this label, and should you take a chance on this wine? 90+ Cellars, a Boston based company, is a virtual winery where they purchase excess wines from established wineries and sell it under their own label, and at a significant discount. The wineries sell this excess wine because either they produced too much or the demand for that specific wine has waned. These wines have already been produced and bottled so all that needs to be done is for 90+ Cellars to have their label placed onto the bottle. They don't just buy any excess wine. There is criteria used to determine which wines they will sell. The criteria is that the wines "...must have a pedigree of 90 or higher ratings, best buy or gold medal accolades from major publications." They cannot though tell the consumer the name of the original winery. That fact must remain anonymous. Each of their wines is assigned a “Lot” number upon release and Lot #15 will be their next wine available, in a couple months. All of the wines are available in limited quantity. Their Reserve selections may only be available in 100-200 cases, while the normal line will be available in the thousands. But once a Lot is gone, it will no longer ever be available. Recently, I met a couple of the guys behind 90+ Cellars, including Kevin and Brett. They invited some local wine writers and wine store owners to taste some of their current wines, and potential future releases. Prior to the event, I had some questions and concerns about 90+ Cellars and intended to raise them at the event. I was unsure how they would handle these issues as they might not be the easiest. I was extremely pleased that Kevin and Brett were honest and forthright in response to my questions. They did not try to evade or obfuscate the issues. Such integrity impressed me. They were also able to clarify several issues for me. Why do they rely on 90+ ratings? First, they do not rely on only such ratings, and at least one of their wines has not received a 90+ rating. As mentioned above, the 90+ rating is only one such possible criteria. They will also consider other significant accolades. Though the label may imply to some that they only rely on 90+ ratings, their website does mention the other criteria. Second, 90+ ratings are important to them because many consumers do consider such ratings when buying wines. They are a business, trying to make money, so it makes financial sense to use ratings if many consumers rely upon them. Especially if they are a new company trying to enter the market. Personally, I would rather consumers relied less on such scores, and were more willing to try wines that maybe did not score as high, or which lack any score. There are plenty of excellent wines that fail to attain a 90+ rating. But I do understand why wineries and stores use scores to promote wines. Another concern for me is that the 90+ Cellar wines generally lack a story, or at least one which can be disseminated to the public. Because of the anonymity of the wines they sell, the consumer cannot learn about the actual winery, cannot heard about the stories behind the wine. Kevin admits that is an issue, and not something that really can be changed. Lot #6 ($13.99), an Unoaked Chardonnay from Australia was excellent, a crisp wine with delicious fruit. Lot #8 ($11.99), a Garnacha from Spain, a delightful melange of bright fruits, including blueberry, some spice notes and a touch of herbal. Very easy drinking and fun wine. Lot #15 (soon to be released), a Pinot Noir from the Carneros region of California. This Pinot has not received a 90+ rating, but I know the source and it is a top producer, as well as one of my favorites. This wine was excellent, and a great value. So will you like the wines of 90+ Cellars? If you want a delicious wine, at a good price, then definitely give them a try. You will miss out on the story of the wine, but that may not matter to you. I certainly would buy some of these wines, based on their taste and low price. So keep an eye out for these wines. Grilled Long Island Duck Breast with Smoked Gouda Risotto and Balsamic Reduction. Tender, meaty slices of duck atop a creamy, smoky risotto with a concentrated, sweet reduction. It is a superb dish, a signature item of the talented Chef Stephen Bell. Back in September, I mentioned the upcoming opening of Bobby's Grille, a new restaurant in Wellesley. The restaurant opened this week and I stopped by last night for dinner with several friends. Based on my positive experience, I believe the future of Bobby's Grille is going to be very bright. I will certainly return there soon and highly recommend that my readers check it out too. The restaurant is medium-sized with a large walnut bar and an elegant yet casual atmosphere. I liked the dark red walls, like a rich burgundy, and the artwork was intriguing, including a large American flag and what looked like a giant owl. The restaurant is open for both lunch and dinner. There is a full bar and they have a menu of special cocktails. Their wine list was interesting with a number of compelling wines. The list has about 35 wines by the bottles, and about half of them are available by the glass. Wines by the glass range from $7.25-$12, and bottles average in the $30s, making the list reasonably priced. We started with the 2008 Bodegas Montesierra Rosé ($7.50/glass, $30/bottle) from the Somontano region of Spain. This small region is not well known yet but they are producing some very good wines, and this Rosé is a fine example. It is very Old World in style, dry, restrained red fruit and some herbal notes. A very food friendly wine I would recommend. We would also ordered the 2005 Podere la Brancaia “Tre” Super Tuscan ($12/glass, $44/bottle). This was also a very good wine, some black cherry and plum flavors with moderate tannins, good complexity and a nice finish. The food menu is has plenty of choices, though the choices are not overwhelming. There are Starters ($8-$14), Soups ($7-$8), Salads ($7-$9), Sandwiches ($9-$14) and Entrees ($10-$29). I think the menu is reasonably priced, especially after considering the portion size of many of the dishes. There are some traditional offerings, such as Shrimp Cocktail and Caesar Salad, as well as more creative dishes such as Lolly Pop Lamb Chops with Tzatziki Sauce and Sliders with Portabello Mushroom, Spinach and Asiago Cheese. I have known Chef Stephen Bell from back when he owned Savory Tastes Cafe in Reading. You can search my blog for multiple, postive reviews of that restaurant. Chef Bell is a very talented and passionate chef. I was saddened when he had to close Savory Tastes but was elated when I learned he would be the Executive Chef at Bobby's Grille. So I had high expectations for the food at Bobby's Grille, and I was not disappointed. Prior to our food starting to arrive, we received baskets of slightly warm, fresh rolls with soft, whipped butter. This is certainly a very good way to start any meal and appeals to my heart. Plus, once our rolls were gone, we were even brought more. I began my dinner with the Duck Breast dish ($9) that is pictured and described at the top of this post. Others at the table had the French Onion Gratinee ($7), Classic Caesar ($9) and Buffalo Chicken Sliders ($9). They enjoyed all of those dishes. The Sliders included three sandwiches, each filled with a good-sized piece of chicken, and accompanied by Cape Cod potato chips. I was the only one who ordered a second course, the White Cheddar and Fontina Mac & Cheese with Lobster ($15). This dish had a light breading atop it, likely panko, and the pasta seemed like it might be fusilli. It was quite delicious, with a strong white cheddar taste, and the pasta was a nice choice. The sweet lobster meat included two claws and some additional pieces. It is a dish I would order again. I should also note you can get the Mac & Cheese without the lobster for only $10 or have it with ham & peas for $11. For my entree, I had the Filet Mignon Sliders ($10) with Sharp Cheddar and Spicy Ketchup. Like the Buffalo Chicken sliders, I received three sandwiches, on soft, fresh rolls with a good-sized piece of filet inside. The meat was very tender and the sliders were quite delicious. A couple of my friends chose the 12oz Filet ($29), which comes with a baked potato and a choice of Bernaise or Madeira sauce. The filets were quite thick, tender and tasty. Both very much enjoyed their steaks. A couple other friends had the BBQ Pork Tenderloin ($21), with a house dry rub, 81 BBQ sauce, sweet corn succotash, red bliss potato hash and cole slaw dollop. Though the pork was very flavorful, both felt the BBQ sauce was a bit overwhelming. They also raved about the hash. Service was generally very good. There were a couple minor service issues, but all easily attributable to the fact that the restaurant just opened. As I have said repeatedly before, all new restaurants need a couple months to iron out all the kinks. I am confident Bobby's Grille will rectify any minor issues in the near future. Overall, I was very pleased with this restaurant. Good wines, nice menu, pleasant ambiance, delicious food, and more. The restaurant was packed last night and the crowds have been growing all week. If you are going, you definitely should try to make reservations. And as word spreads, I am sure it will be even busier. I recommend you check out Bobbys Grille and tell them the Passionate Foodie sent you. I will be returning soon and will keep you all updated. There are plenty of other dishes that I want to try. Please come back and tell me your own thoughts about the restaurant. I have mentioned numerous times that I am a big fan of small plates. I love the chance to taste a wide variety of dishes, and I don't mind sharing. Now Burtons Grill is offering a special small plates menu. For only $4.95 you can select several delicious items from the menu below. These small plates are available at all Burtons Grill locations, from Monday through Sunday from 3:00pm to close! You can pair these dishes with a hand crafted cocktails such as the Harvest Sangria or the Spiced Cider Mojito. Combine all ingredients in iced cocktail shaker and shake well. Pour into wine glass and garnish with a splash of ginger ale, sliced apples and dried cranberries. In a pint glass muddle mint, limes, and Cinnamon Simple Syrup together. Fill glass with ice and add remaining ingredients. Top with Boston Shaker and shake well. Pour back into glass, top with Ginger Ale and serve. Last month, I told my readers about the potential changes coming to the OurGlass Wine Co. in Saugus. The store was under new ownership, the Golden Goose Market located in the North End. David Saul, the new Manager/Wine Buyer discussed his plans for the wine store. Unfortunately, the owners recently decided to close the Saugus store. The store is now closed though there is a sign indicating it may come under new management. It will be interesting to see what develops there. I was very pleased when I read today's Boston Herald because they had a large article on Saké in their food section. The article, The Saké King, primarily discusses Lloyd Foster, the director of marketing for Classic Wine Imports in Norwood. Classic Wine Imports currently brings in 100+ Sakés and your local store may do business with them. The article then gives a brief summary about Saké, including what temperature to serve them. The article also contains recipes for four cocktails using Saké including: Sakétini, Saké Bloody Mary, Saké Sunrise and Saké Sour. Where Are The Women? Myers+Chang! If I were single, I know which restaurant I would frequent, Myers+Chang. Why? Because that is where so many women are dining. Almost 85% of the restaurant's customers are female. A staggering statistic which shocked me when I first heard it. In the current Stuff Magazine (11/17-11/30/09), there is an interview (p.58) with Christopher Myers, co-owner of Myers+Chang. Christopher stated that their clientele is almost 85% women. He believes that might be due to the restaurant serving many small plates. He assumes that many men in Boston don't want to share plates with others, or eat off a plate that is sitting in front of another. I also spoke with Chef Joanne Chang, Christopher's wife and co-owner of the restaurant. She confirmed the statistic about their clientele and further supported the potential reasons for such. Though the restaurant often sees groups of women dining together, they rarely see groups of men there. Usually, the men that do dine there are accompanied by women. It does not seem the type of place that businessmen choose for business meetings. So, is there such a gender difference over sharing small plates? Do men have problems sharing small plates with other men? If so, why do they feel that way? Are women just more social and willing to share? Until I learned the statistic about Myers+Chang, I would not have imagined it was a place frequented far more by women. To me, it was a restaurant that should appeal to both men and women. I saw nothing inherently feminine about the restaurant. Plus, I am not bothered by sharing small plates with a group of my male friends, and have done so at other small plate restaurants. But now that I have pondered about it, I can understand how some men might feel. Sharing plates can be seen as an intimate act, and probably not appropriate for most business meetings. And some men probably don't want to do something that intimate, even with their male friends. It may seem more an act they would only do with a wife or girlfriend. A brief poll of several men on Twitter showed a division, that some men felt like me while others did have issues with sharing plates. It might be just a cultural matter particular to American men, or men from similar cultures. For example, in numerous Asian cultures, sharing plates is very common. So maybe they would not have the same issue as American men. But why doesn't a group of men go to Myers+Chang and each order their own group of small plates? Nothing says they have to share the dishes they order. They are missing out on some great food. And all of the women that are there! Maybe these men should reconsider their position. Next month, you might be interested in attending Bubbles & Bites, a charity event to benefit the SHADE Foundation of America. Bubbles & Bites is a holiday champagne dine-around reception featuring Curt and Shonda Schilling, the founders of SHADE Foundation. The event includes a holiday gift silent and live auction, as well as champagne and cuisine by Boston chefs including: Todd English, Jeff Fournier, Dante de Magistris, Rodney Murillo, and many more. The event emcee will be Kathryn Tappen, who serves as NESN’s Boston Bruins studio host and as an anchor and reporter for "SportsDesk," NESN’s popular sports news, information and highlights program. The SHADE Foundation of America was founded in 2002 following Shonda Schilling’s battle with melanoma. Over one million new cases of skin cancer are diagnosed each year, and it’s estimated that of those, over 60,000 diagnosed in 2008 will be melanoma, the most deadly form of skin cancer. Today, 1 in 5 children will grow up to develop skin cancer, which is currently the number one cancer killer among women ages 25-29. However, skin cancer in 95% preventable and 95% treatable if caught early. Bubbles & Bites will be held on Wednesday, December 9. The event is being held at the Ritz Carlton Boston Common, 10 Avery Street, Boston. Tickets can be ordered online at SHADE Foundation. Tickets start out at $150 per person for general admission. $250 for VIP reception. $250 per couple offered until November 15, 2009. As I promised previously in a post about an excellent Saké tasting, I have returned to tell my readers more about Ball Square Fine Wines & Liquors, a newly renovated store in Somerville. I never saw the store before the renovations but I liked what I saw now. And it has a diverse selection of wines which also appealed to me. It is a moderately-sized store and sells wine, beer and spirits, most of the wines in wooden racks. Above is your view when you enter the store, U.S. wines on the right side of the room. The wines are generally separated by country of origin and cover all price points. They have some of the more common brands as well as some lesser known ones too. The above photo is the cashier station, located just to the left of the entrance. Behind the cashier station is the new tasting table, a well-appointed area. It adds a bit more elegance to tasting events, though it is not pretentious. It is still a small area, so it could get crowded if too many customers show up for a tasting. One of my favorite things with the store is that they stock a fair number of Sakés, which you can see above, including many half-bottles (300ml). Half bottles, at their reduced price, can be a great way to take a chance. There are few other local wine stores that stock as much Saké so that makes this place a fine destination for Saké lovers. Ball Square also has a large selection of Greek wines, a specialty of the owner. You'll can even find several different brands of Ouzo. Greek wines are another type of wine that are difficult to locate in most local wine stores so it is great to see the available selection here. My readers will know I very much enjoy Greek wines so this is another advantage of this store. Above, in the foreground, are the shelves holding Ports and Sherries while to the rear are the shelves of spirits. They have a large and nice selection of Ports and Sherries, including Colheita, Vintage Port, Amontillado and more. The spirits selection is very good too, with some interesting high-end ones. The store holds regular wine tastings and special events, and it is well worth signing up for their email newsletter to stay current on what is going on. For example, this Friday, November 20, from 5:30pm-7:30pm, Bill Russell, owner/winemaker of Westport Rivers Winery, which is located in Massachusetts, will be at the store pouring some of his wines. Westport makes a sparkling wine that I really enjoy, which would be good for Thanksgiving. There are definite reasons why you should check out Ball Square so why not stop by? Rant: How Big is Too Big? Can a restaurant menu be too big? Can there be so many options on a menu that it overwhelms the diner? What is the optimal size for a menu? Most of us have probably been to a restaurant that has a very lengthy menu, with dozens upon dozens of choices. As you flip through page after page, it can be difficult to decide on what to eat. There is a sensory overload, a flood of options which can paralyze your decision. I don't think all of those selections are necessary, and may even hurt the restaurant. I prefer a smaller menu, with lesser choices. But then I would also have the expectation that the restaurant, with less menu choices, would be better able to produce quality food. The kitchen would be able to specialize more, hopefully leading to better quality. They would not have to produce such a wide variety of items, with a greater chance for mistakes. I can't believe that a restaurant with a lengthy menu actually sells lots of each listed dish. There are probably items that don't get ordered for weeks on end, if at all. So why keep those dishes on the menu? If the restaurant stocks the ingredients for those neglected dishes, do the ingredients go bad before the dish is ordered? It would seem more economical to have a smaller menu, and thus a smaller amount of ingredients, and less chance the ingredients get stale or something. So what is your opinion on big menus? A new wine lover's destination has now opened in Central Square, Cambridge. It is a place to find interesting wines and delicious foods, owned and operated by four very passionate individuals. If the Grand Opening was any indication, the crowds are going to be flocking there. Central Bottle has now opened and I recently attended their Grand Opening event. Since my original post about this new store, I have been excited, awaiting their opening. My hopes for this store appear they will come to fruition. The store is moderately-sized and the front, pictured above, is made of numerous floor to ceiling windows, looking out onto Massachusetts Avenue. This will give much natural lighting during the day. The inside has a more modern decor, though somewhat minimalistic. I cannot fully assess the look of the store though as it has not yet been finalized. For the Grand Opening, they left the store very spacious and open. That will soon change though when more wine racks are added to the middle of the store. They will also be situating their wine bar into the space. I will post again once I have seen the final look of the store. At the Grand Opening, two walls were lined with wine. The wall pictured above was almost all Italian wines, and you can note the boxed wines in the lower left corner. The other wall had wines from all over the world, though the majority seemed more Old World. Additional wines will be displayed soon when they add the extra racks. I know many of the wines that were displayed and they include plenty of excellent, artisan wines. These are not the ordinary, mass produced wines you can find in any liquor store. These are the more unique wines which will really entice wine lovers. Plus, the average consumer will love them once they taste them. A very impressive selection, and no less than expected. This is a place to take your time, perusing the available selections. Prices are average, and they cover all price points. Besides the wine, Central Bottle will sell cheese, meats, bread, and other gourmet foods. Though not everything was available at the Grand Opening, the appetizers they passed around showed the high quality of the foods they will carry. One of the highlights of the event was getting to meet again Mario Zanusso of I Clivi, a high quality winery I have reviewed before. They even currently produce two killer boxed wines. I got to taste the new vintages of his wines, as well as chat a bit about the future of his winery. For one, Mario mentioned that future vintages will be different than the current ones, being lighter and with unique flavors, due to changes in their wine making process. For example, they will be using gentler pressure when pressing the grapes. They have also planted some Ribolla, so we might see such wines in the future. Another highlight was a Skype video interview with Carl Sutton of Sutton Cellars. I have been a fan of his wines for some time and have previously posted reviews of his Rattlesnake Rose, Carignane, and Syrah. Sutton Cellars is a small, artisanal winery in California and their low production wines are absolutely delicious and very reasonably priced. Carl was very down-to-earth and passionate about his wines. Carl stated that he wants to make the type of wines where a person will have a glass and then crave a second one. I think he has accomplished that goal with all of his wines I have tasted. He also wants to make wines without pretension, which would appeal to people with which he would enjoy drinking. That is also why he prices his wines as he does, often under $20 for very low production wines, which may only be 200-300 cases. These are wines of excellent value. Central Bottle will be doing more Skype interviews with wine makers and you can check their website for a calendar of such events. You will have the chance to listen, live, to wine makers as well as have the chance to ask them questions. There were other wines available for tasting from Oz Pacific and Rosenthal Imports, a nice sampling of what the store has to offer. A significant crowd was present for all of the time that I was there, and many of them seemed to be purchasing wine. All of those I spoke to seemed to really enjoy the new store. The future of Central Bottle seems bright, and there is much to look forward too, such as Thursday evenings when the store becomes a wine bar. If you check out their website, you will see all of the events they have planned for the next couple months. I will be checking the progress of the store, as well as stopping by for the wine bar, and will report back once I do. I recommend that you also stop by Central Bottle and find some exciting wine and food. Seeking some excellent but inexpensive Saké? If so, I have a new place to recommend to you. Yesterday, I attended the Grand Opening of Wine ConneXtion, a new wine store in North Andover. I previously recommended this new store, especially because of their incredibly low prices. I was glad to see that the store has gotten even better since my initial visit, and I continue to highly recommend this place. The Grand Opening was well attended and the store had plenty to interest their guests. First, there were over 50 wines available for tasting. Wine prices ranged from $6.99 to $84.99, and all of the prices were cheaper than you will likely find anywhere else locally, or even in New Hampshire. A few of my favorites of the tasting included: 2006 Pride Merlot, 2008 Rombauer Chardonnay, 207 Evodia Garnacha, and the 2007 San Marzano Primitivo. Second, besides some cheese and crackers, Chef Tom Grella from the Food Network's Next Star series prepared several delicious dishes on the premises. Working non-stop through the wine tasting, Grella made dish after dish, including cheese ravioli in a spicy marinara sauce, a corn hash topped by roasted turkey and a BBQ cranberry sauce, seared scallop atop mashed sweet potato and gemelli in a white truffle cream sauce. The gemelli dish was my favorite though all of the foods were very good. It is always such an enjoyment to taste wines with good food. As I perused the aisles of wine, I noticed they carried more wines than my last visit. For example, their special high-end wine room had more wines, including the Caymus Cabernet Sauvignon Special Selection (for only $99!). But what most thrilled me was to see they now carry Saké! These are all very good, and would be perfect too for those new to Saké. Plus the prices are excellent! For example, at other local stores, the Ichishima Honjozo is around $30 while the Hakushika is around $9. I bought several bottles to stock up on my dwindling supply and will definitely return for more. If you have not visited Wine ConneXtion, then make the effort to do so. I like what the store has done, as well as the ideas they have for the future. You can't beat their prices, and with about 700 different wines, there is something for everyone. Why not buy some Saké too? The name of Gaja is one of the most recognizable and respected known names in Italian wine. They produce top notch Italian wines which are coveted by people all over the world. You now have the opportunity to taste some of their benchmark wines, as well as to meet Gaia Gaja, the daughter of Angelo Gaja. Then, Kappy's Fine Wine & Spirits on Route 1N, Malden will hold their own Gaja tasting on Friday, November 20, from 5-7pm. They will offer the following wines, all discounted for the tasting. 1) 2008 Gaja Rossj Bass Chardonnay. Regular price $95, special sale price $67.99. 2) 2006 Ca'Marcanda Promis (Merlot/Syrah/Sangiovese). Regular price $53, special sale price $38.99. 3) 2006 Ca'Marcanda Magari (Merlot/CabFranc/CabSauv). Regular price $85, special sale price $59.99. 4) 2007 Gaja Sito Moresco (Nebbiolo/Merlot/CabSauv). Regular price $70, special sale price $51.99. 5) 2006 Gaja Barbaresco. Regular price $240, special sale price $171.99. 6) 2005 Gaja Sperrs (Nebbiolo). Regular price $280, special sale price $199.99. 7) 2004 Pieve Santa Restituta Brunello di Montalcino "Sugarille." Regular price $200, sale price $143.99. They will also have an additional handful of "cellar selections" of Gaja's Piedmont wines available for sale on that day. Cast your memory back to Thanksgiving of 2008. Can you remember which specific wines you had with dinner? I am sure that most people won't be able to remember, except maybe that they had a Pinot Noir or a Riesling. They are unlikely to recall the specific producer or much else about the wine. What they are more likely to remember is the good (at least hopefully it was good) time you had, the family and friends that shared your table. You might remember whether the food and wine was good or bad. But the specifics may be foggy. Every year at this time, you will see plenty of magazine, newspaper and online articles that provide specific wine recommendations for Thanksgiving. If you read several of them, you may realize that they present quite a diverse choice of recommendations. There are few types of wine that someone does not recommend. I could do the same here, provide more such recommendations. But do you really need that? The more I thought about it, the more I realized that all you need for Thanksgiving are some good wines, the varietals and/or blends being much less important. As long as they do not blatantly clash with the meal, then they should work. And few wines are going to so blatantly clash. A Thanksgiving meal is diverse, with many different flavors, from savory to sweet, and many different textures. No single wine is a perfect pairing with all these different dishes. So you need wines that people will enjoy in of their own right. I don't think too many hosts are seeking the "perfect" wine pairing. They simply want something that people will enjoy and which won't greatly detract from the food. Plus, who will remember the wines next year? We must also remember that any wine shared with good friends and family is likely to taste better, or at least seem that way, than one drank alone. The circumstances of the day, the good feelings, the fond memories, the thanks for the past year, will all lead to your wine seeming better. And it is all those urrounding circumstances that people will most remember about Thanksgiving. The wine will always take the back seat. The wine is simply an extra, not a necessity. It pales in importance to everything else about the holiday. Like the Whos from "The Grinch Who Stole Xmas", there should still be joy even if all of the food and wine have been taken away. I will probably bring a variety of wines to my Thanksgiving feast, a mix of sparkling wine, white, red and dessert wine. In general, I will pick interesting and delicious wines that I feel people will enjoy. I won't spend much time worrying about pairing them with specific dishes and foods. I just want wines that will make people smile. I am always ecstatic when I find an amazing new wine or Saké, a drink that impresses my palate and makes me crave more and more. Earlier this week, I found just such a Saké at a local tasting and it was one of the highlights of my week. Plus, I found a wine store that stocks a fair number of different Sakés. All in all, some great finds. I have been on the mailing list of Ball Square Fine Wines in Somerville, receiving their newsletters, but had not checked out the store until this week. On Tuesday, they held a Saké tasting and that fact was sufficient to get me to trek out to the store. I'll report further on the store in the near future, and concentrate here on the details of the tasting. There were four Sakés at the tasting and all were from the Akita Prefecture of Japan. Akita is a northern region and has very cold winters, a perfect place to brew Saké. This region is represented by Linda Noel Kawabata, pictured above, who is the U.S. Brand manager for the Akita Sake Promotion and Export Council (ASPEC), a consortium of five Saké breweries including Hinomaru Jozo, Suzuki Shuzouten, Akita Seishu, Tenju and Ginrin Brewery. Linda was very personable and seemed both passionate and very knowledgeable about Saké. The first Saké I tasted was the Minato "Harbor" Tsuchizaki Yamahai Futsuu-Shu, ($24.99) made by the Naba Shoten brewery. The brewery uses locally grown rice, a special yeast brand, and water from the nearby Omono River. They chose the name "minato", which means "harbor," due to the local fishermen who have long enjoyed their Saké. Only 33% of the rice, Miyamanishiki, has been polished away and it has a SMV of +1, making it slightly sweet. This Saké had an earthy smell, likely due to the Yamahai brewing method. I actually found it to be dry, and not really sweet, though that might also be due to its high acidity. It was full bodied with a wild flavor, probably not something that would appeal to a person new to Saké. But if you already enjoy it, then this would likely appeal to you. It could easily stand up to heartier foods, or maybe something with a gamier flavor, like lamb or wild boar. Next up was the Dewatsuru Habataki Junmai Ginjo ($31.99), made by the Akita Seishu brewery. The brewery's philosophy is "Good harmony makes good saké." They try to rely on local ingredients whenever possible. 45% of the rice, Akinosei, has been polished away (qualifying it as a ginjo) and it has a SMV of +5, making it a dry Saké. I found it to have a mild nose, only a slight aroma of steamed rice. Its taste was also mild and smooth, with a bit of minerality. It was good though not impressive, but it should appeal to those new to Saké. It did pair very well though with some creamy goat cheese, and might make a nice pairing for other creamy cheese, or light seafood dishes. The final two Sakés were produced by the Hinomaru Jozo Brewery and the owner, Jouji Sato (pictured above), was present to showcase two of his products. Though he did not speak English fluently, and we needed a translator for some matters, his charisma and passion were obvious. You couldn't help but like Mr. Sato. The Hinomaru brewery was founded in 1689 so it has a rich, vibrant history. It is a small, very traditional brewery. The brewery took its name from the family crest of the ruling Satake clan: a folding fan with a hinomaru ("sun") design. They are the only ones permitted to use the "Hinomaru" name, which is also the name of Japan’s national flag. Mr. Sato, who used to work in banking, assumed control of the brewery upon his father's death, taking over the family business. The brewery's philosophy is to make “the truest of the true” Saké. One of their more unusual brewing techniques is that they age their Saké in the bottles, usually for about a year. There are few, if any, other breweries which do this. According to Mr. Sato, “..the bottle aging prevents oxidation and flavor loss, and preserves our exceptional quality.” Their brand name, “Manabito,” is taken from a local mountain that overlooks the fields where the Saké rice is grown. It is also a word that means a person who is "true blue." I initially tasted their Manabito Kimoto Junmai Ginjo ($21.99/300ml) and it was amazing, immediately impressing me. It is simply one of the best Sakés I have tasted in quite some time. 45% of the rice, Takane Monori, has been polished away (qualifying it as a ginjo) and it has a SMV of +5, making it a dry Saké. It is also a Kimoto, meaning it is brewed through a very traditional, laborious, and risky method. Most Saké brewed in this method has an earthy, funky flavor. Its nose though really lacked any earthiness, and had more of a subtle fruitiness and slight rice aroma. From my first sip, this Saké seduced my palate with its complex, rich and smooth taste that possessed only hints of earthiness. It had good acidity, a lengthy finish and was very well balanced. It was very different from any previous Kimoto I have tasted, being much mellower. This Saké should please anyone, whether you already love Saké or not. Because of its richness, this would pair well with heavier foods, from fried foods to fatty meats. I cannot recommend this Saké enough and I made sure to buy several bottles. It was such an exceptional brew and at this price, it is a very good value too. The final Saké of the evening was the Manabito Junmai Daiginjo ($24.99/300ml). 50% of the rice, Miyamanishiki, has been polished away (qualifying it as a daiginjo) and it has a SMV of +3, making it a slightly dry Saké. This was a very elegant Saké with a more floral nose, as well as some floral accents on the palate along with subtle fruit flavors. A smooth drink with a lengthy finish, this is a Saké to slowly sip over dinner, such as light seafood. I bought a few bottles of this as well. If you can't make it to Ball Square Fine Wines to buy these Sakés, then you should know they are imported and distributed in the U.S. by Winebow. At the tasting, representing Winebow, was Claudio LoCascio, the Brand Manager for their Saké portfolio. If nothing else, you need to taste the Manabito Kimoto Junmai Ginjo. I will be sure to keep some of it stocked in my own cellar. For unknown reasons, Troquet remains in the shadows of Boston's culinary scene. But for those in the know, it is a shining jewel, providing fine food, wine and dessert. It has all your bases covered under one roof. And it continues to receive my highest recommendation. I have been to Troquet numerous times, and most recently attended a media dinner there which only further solidified my opinion about this excellent restaurant. Jackie of the Leather District Gourmet has already posted her own opinion of Troquet and it is well worth reading. There are several reasons why Troquet is a compelling restaurant. Executive Chef Scott Hebert creates delicious and innovative food. For example, he is the only chef I know of in the Boston area making a sublime lamb bacon. Owner Chris Campbell has created an extensive, intriguing and very reasonably priced wine list. The wine prices are some of the best you will find at any Boston restaurant. Pastry Chef Sarah Woodfine produces amazing and creative desserts. Her seasonal souffles are superb. Plus service is excellent. But when the best Boston restaurants are discussed, Troquet often seems excluded from the talk. It is puzzling to me, but that simply means it is more of a hidden gem. If you have never been there, you must visit and check out their excellent cuisine and wine. The media dinner began with a glass of NV Ruinart Rose, a delicious bubbly that was not overly sweet and had a nice fruity taste, which was paired with a Scallop Ceviche topped with Spoonbill caviar. A nice presentation with tender scallops, a pleasant citrus flavor and a slight saltiness from the caviar. A light and clean dish which was a perfect start to the meal. Next up was a New Zealand Langoustine wrapped in Brik dough atop mango curry and Thai basil. This was a tasty dish, with a thin, crisp wrapping around the langoustine and a more sweet taste to the sauce. The wine pairing was a 2006 Rauscher-Haart Piesporter Goldtröpfchen Riesling Kabinett but I did not think it went as well as it could with the dish. The Riesling had pleasant citrus flavors and was slightly sweet. It was a good wine but I think it would have paired better with a spicier dish rather than the langoustine. The Branzino, European seabass, was stuffed with Sicilian olives and sat atop spaghetti squash. A delicious, tender piece of fish with a layer of crisp skin and some salty/earthy flavors from the olives. The wine pairing was the excellent 2008 Les Chanteaux Blanc Chenin Blanc, a French wine from the Loire Valley. This Chenin had delicious fruit, plenty of acidity, and a bit of minerality. It had a lengthy, satisfying finish and plenty of character. This would be a perfect choice with many types of seafood and other light dishes. Our next course was exceptional with a perfect wine pairing. The Baked Rigatoni came with wild boar, porcini mushrooms, parmesan foam and shaved white truffles. Rich, flavorful and earthy, this was a dish to slowly savor every wonderful bite. Everything from the pasta to boar was cooked perfectly, and all of the ingredients complemented each other. What could make this dish even better? Only a killer wine like the 1995 Louis Latour Chambertin Grand Cru Cuvée Héritiers Burgundy. A fine Burgundy is such a great wine anyways, and it just accompanied this dish so well. Sublime and complex, this wine was extremely satisfying. The slow roasted Vermont Lamb Saddle with lamb bacon, lamb jus with Niçoise jus, fava beans and pearl barley was another amazing course. The lamb was tender, flavorful and cooked just right while the lamb bacon was exceptional, as usual. I am a huge fan of lamb and this dish was one of the better ones I have tasted in some time. Once again, the wine pairing was perfect, this time with a 1989 Paul Jaboulet Aîné Hermitage La Chapelle. This Rhone wine was smooth, complex and with just the right combination of fruit, spice and earthiness to complement the lamb. Next up was a Cheese Course, a cheese cart being brought out and we were able to select a few of the available selections. Accompanying the cheese was the 1927 Alvear Pedro Ximenez, a fine choice with delicious nutty flavors and only a mild sweetness. The cheeses I tried, which I can't recall their exact names, were all delicious, especially a triple creme. I can enjoy a cheese course as much as a dessert course, but at Troquet I can never skip dessert. For dessert, everyone was brought a different dish, and mine, pictured above, was a version of Bread Pudding. You can see the amazing presentation of this dish, with fresh fruit, home made ice cream, and more. An absolutely delicious dessert, with lots of flavors that all blended together very well. I have high expectations from Pastry Chef Woodfine and she has yet to disappoint. The wine pairing for dessert was an Inniskillin Ice Wine Riesling, a sweet dessert wine with enough acidity so as to not be cloying. I was thoroughly sated at the end of the dinner, just so much good food. Service was excellent and my dining companions and I had engaged in some fun and interesting conversation. Dinner only cemented my thoughts about Troquet and you owe it to yourself to check out this fine restaurant. And make sure to stay for dessert. On a recent Thursday evening, when my regular group of wine buddies got together, we tasted six wines I had received as samples from Pasternak Wine Imports. Pasternak is a national importer of wines and spirits from France, Spain, Australia, New Zealand, Argentina, Chile, and California. The company is jointly owned by James Galtieri (President and CEO), and Domaines Barons de Rothschild (Lafite). The six wines were all inexpensive, costing no more than $12.99, so they had the potential to be value wines. Of these wines, three appealed to almost all of the tasters. Of the other three, two were generally disliked by all and one had a divided opinion. The most expensive wine of the evening was the 2007 Dievole Pinocchio ($12.99), a wine produced in Sicily and made from 100% Nero d'Avola. It sees no oak and only has an alcohol content of 13%. Unfortunately, it was also a wine that almost everyone disliked. It had an overwhelming candy-like smell, several thinking it smelled like cotton candy. That overly sweet smell carried through in the taste as well, making it seem like liquid candy and just not too appealing. The 2007 Les Deux Rives Corbieres Rouge ($9.99) was produced in Corbieries, France, and is a blend of 40% Grenache, 30% Syrah, 20% Mourvedre, and 10% Carignan. This wine had a sour, off-putting smell though it did not carry through on the palate. The taste was ok, but nothing special. It was a rather forgettable wine, and not something my buddies would buy if they had a choice. The 2008 Vina Los Vascos Sauvignon Blanc ($11.49) was produced in the Casablanca Valley, Chile and is made from 100% Sauvignon Blanc. Opinions were divided on this wine, but as several of my buddies really don't like white wines much, I was not surprised by those who did not care for it. This wine sees no oak and has an alcohol content of 13%. It had an intense grapefruit smell with some lemony notes. On the palate, you get both the grapefruit and lemon, as well as some minerality. This crisp wine lacks the grassiness of some other Sauvignon Blancs. I think it was a pleasant wine, and would be a good wine with seafood or light chicken dishes. The 2007 Chateau De Jau Jaja de Jau Syrah ($8.99) is from the Roussillon region of France, and is made from 100% Syrah. This simple wine pleased most of my buddies. It had a pleasant red fruit and spice nose, and was a smooth, easy drinking wine. Besides the red fruit and light spice flavors, there was a slight herbal taste too. A step above the wines at this price point, I would recommend this wine. The 2008 Terracita Tempranillo ($8.99) is a Vinos de la Tierra de Castilla from Spain. It was another wine that pleased most of my wine buddies. It had more cherry and raspberry flavors with hints of vanilla. The tannins were very mild, making this an easy-drinking wine and a good value for the price. A nice choice to pair with everything from pizza to burgers. The 2007 Bodega La Rural Trumpeter Malbec ($11.99) is from Mendoza, Argentina, and is made from 100% Malbec. It undergoes about seven months of oak aging, 20% new American, 20% new French, and 60% second and third use American. This wine was the big winner of the night. It was dark red in color with an intense nose of black fruits and hints of spice. On the palate, there was plenty of concentrated fruit, including ripe plum, blueberry, and black cherry. Tannins were restrained and the finish was long and satisfying. Plenty of character for this price makes this an excellent value wine. My new column of "A Passionate Foodie" can be found in the November 11 issue of the Stoneham Sun newspaper. This is a weekly column that concentrates on reviews of local restaurants though it also sometimes touches on other food and wine topics. The new column has been published today and will be available online soon. The new article is a review of Olde Redding Butcher Shoppe, a new butcher shop in Reading. Find fresh meats, deli meats, sandwiches, soups, salads, and prepared foods. A local shop, run by local residents, which promises excellent customer service. Prior to seeing Penn & Teller at the Rio Hotel & Casino (which turned out to be a superb show), we decided to grab a bit to eat and chose Gaylord India Restaurant, which is located in the Rio. Once you walk past the lucky elephants, their trunks raised, you enter an elegant yet casual restaurant. As we perused the menu, we received a couple complimentary papadums, crispy spiced lentil wafers. The menu is extensive with plenty of the usual Indian dishes, from pakora to vindaloo, from tandoori to biriyani. Most of the entrees range from $20-$30, making their prices more expensive than usual for such places. Even the appetizers seem a bit more expensive than usual. We began with an appetizer, the Lamb Samosa (2 for $9.95), a crisp turnover stuffed with spiced ground lamb. This seemed to be the freshest samosa I have ever had, and it was absolutely delicious with plenty of meat and a tasty blend of spices. The turnover was crisp and crunchy, without being overcooked. An excellent start to our dinner and a dish I would highly recommend. The first entree was the Chicken Pasanda ($22.95), boneless chicken pieces in a mild cashew cream sauce. There was plenty of chicken, which was very tender and moist. It almost fell apart on its own. The cream sauce was very good, creamy with only a mild nuttiness to it and some restrained spices. The second entree was the Chicken Tikka Masala ($22.95), mesquite-broiled chicken in a mild tomato-butter sauce. The chicken was as good as in the Pasanda, and the sauce was also mild and restrained, with lots of subtle flavors and a nice creaminess. I love Indian breads, and they are one of my favorite items whenever I go to an Indian restaurant. We ordered a Garlic Nan ($5.50) and Paratha ($4.20). I enjoyed the Nan, which had plenty of garlic, but the Paratha was a bit disappointing, seeming to be a bit overcooked from what I usually get elsewhere. Service was excellent. Overall, the food was very good, though I am not sure worth the extra price. But it is in a Vegas hotel which could explain the higher cost. If you don't mind the extra cost, then you should enjoy your meal here. Want Free Lamb & Chocolate?